Chica Boom is a all women salsa group formed by salsa-loving women under the leadership of Azusa Morimura. Since their debut at "Harajuku Crocodile" in Tokyo Japan in 1985 they have been performing frequently in clubs and many musical events in Japan. 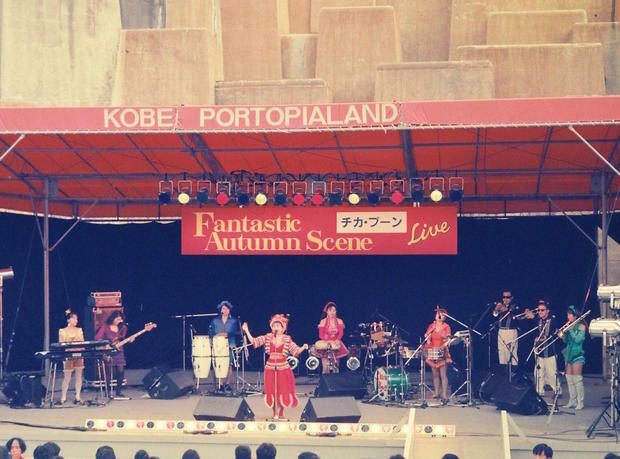 Taking advantage of Azusa Morimura's attendance at "Carnaval en la habana" in Cuba in1988, the band was invited to the carnival anually from 1989 through 1992. During their stay in Cuba, they made appearances on TV and radio shows, and also attended at dance and percussion seminars held by "Conjunto Folklorico National de Cuba". In 1992, their first album " Chica Boom" was released from Victor Entertainment Records and the group became recognized as a pop/salsa group singing in Japanese and got many fans. In 1993, they won "The Brightest Hope Award" of "Gold Disk Awards". As a result of this honor, they made salsa music more popular throughout Japan. And in this year, they also made a tour in France with great success. Many songs of Chica Boom have been used for TV commercials such as McDonalds, Kansai cellular, Leoma World, Kiyoh Bank and others. And their hit single "Haru Natsu Aki Fuyu" was introduced as the title song for one of the top-rated TV programs, "Kamisan No Waruguchi". Chica Boom has released 6 albums, 8 singles and 7 promotion videos up to the present.